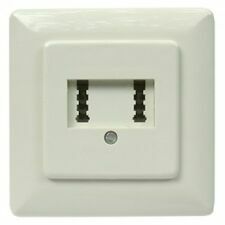 BT Double Adaptor,1x BT Plug- 2x BT Sockets. BT Splitter. 1x BT Plug - 2x BT Sockets. BT Double Adaptor. T Shaped Adaptor. Connections: 4 Pin RJ11 Plug - 4 Pin RJ11 Plug. Length: 3m. 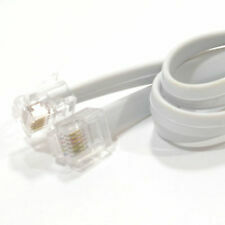 100m Telefonkabel 10x2x0,6mm JYSTY - 20 Adern - ISDN Fernmeldekabel Verlegekabel. The adapter replaces the microphone level audio signal with a line level input, enabling you to record on your phone or tablet as if the sound was coming from your device itself. The Headset Buddy adapter is an attenuator cable that replaces your smartphone's audio signal with the line level input. 50m Telefonkabel 10x2x0,6mm JYSTY - 20 Adern - ISDN Fernmeldekabel Verlegekabel. Field wireable. Cooper #GFI12A1NN 2ft portable single-tap gfci cordset with wire leads. Made of high-strength polycarbonate housing for durability. Single straight blade molded plug style. Features include. 50m Telefonkabel 6x2x0,6mm JYSTY - 12 Adern - ISDN Fernmeldekabel Verlegekabel. Low profile design lies flat under carpets and along baseboards. Wire is stranded. 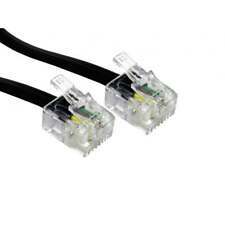 Used for standard 1- and 2-line residential phone systems. (SKU # LC2684-25W-5PK; Weight: 2.46 lbs.). 50m Telefonkabel 8x2x0,6mm JYSTY - 16 Adern - ISDN Fernmeldekabel Verlegekabel. 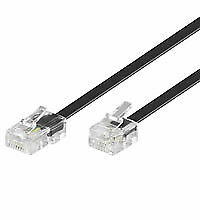 100m Telefonkabel 8x2x0,6mm JYSTY - 16 Adern - ISDN Fernmeldekabel Verlegekabel. 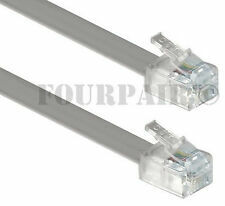 25m Telefonkabel 6x2x0,6mm JYSTY - 12 Adern - ISDN Fernmeldekabel Verlegekabel. For use in a modular phone system. Tools required: crimping tool, wire cutters. (SKU # LC0257-C-12x25PK; Weight: 1.95 lbs.). 100m Telefonkabel 4x2x0,6mm JYSTY - 8 Adern - ISDN Fernmeldekabel Verlegekabel. 100m Telefonkabel 6x2x0,6mm JYSTY - 12 Adern - ISDN Fernmeldekabel Verlegekabel. Connect to your phone, FAX and wall jacks, and go! One line for phone, internet and fax. Rings when a phone call or FAX is incoming. Plug and Play easy! 2 way splitter, ethernet cable, phone jumper, 6ft coax jumper, and 12 ft coax jumper! If you count 6 pins then this detangler will not work as that is an RJ12 port. Works with most all models of handsets & handset cords . 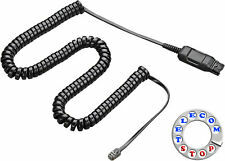 Increases durability and extends life of handset cords. Phone Cord Swivel-Twistop. 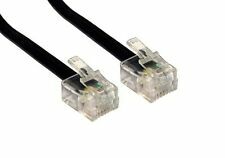 25m Telefonkabel 10x2x0,6mm JYSTY - 20 Adern - ISDN Fernmeldekabel Verlegekabel. Cooper #GFI12A133 2ft portable single-tap gfci cordset. Made of high-strength polycarbonate housing for durability. Single straight blade molded plug style. Features include Length: 2ft. Compact body design. Plantronics APP-51 Savi Headset Hook Switch (EHS) Adapter for Polycom IP Phone!! Check out our other phone adapter and accessories for sale! Cooper #GFI12M166 2ft yellow watertight portable single-tap gfci cord. Cooper automatic gfci cord has a straight blade plug and connector. Made of high-strength polycarbonate housing for durability. Voice Over Internet (VoIP). Plug base unit into any electrical outlet near an existing phone jack or VoIP adapter. No hookup, tools, cutting or drilling, plug-n-play unit. DVR's and TiVo. Extension Unit. RJ11 6P4C 4 wire/conductor Y Splitter (a.k.a. T). 1 Male to 2 Females ( 1 plug to 2 jacks) aka 2way. Lets you plug 2 devices into 1 phone line/jack. Color: White. We are building up to our full product line of over 2,000 parts. 100m Telefonkabel 2x2x0,6mm JYSTY - 4 Adern - ISDN Fernmeldekabel Verlegekabel. 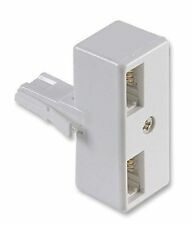 10 Leviton 40580-W white modular phone jack wall plates. Features include (SKU # L40580-W-10PK; Weight: 1.5 lbs.). AND OTHERS ! Your correspondence is very important to us. Phone Number will be required. We will NOT falsify forms of this kind. What are your hours?. 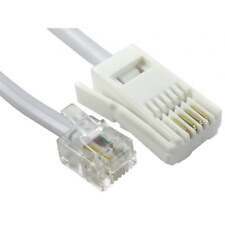 If you count 6 pins then this detangler will not work as that is an RJ12 port. Works with most all models of handsets & handset cords . Increases durability and extends the life of handset cords. Phone Cord Swivel-Twistop. 50m Telefonkabel 2x2x0,6mm JYSTY - 4 Adern - ISDN Fernmeldekabel Verlegekabel. GE Instajack Wireless Phone Jack System NEW Modems Satellite Internet Model 86597. Condition is New. Shipped with USPS Priority Mail. Small tear on blister pack, but is unopened. 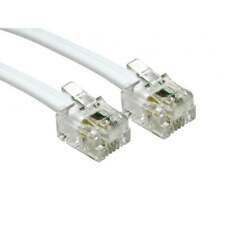 ( 100 Feet Bulk ) Cat3 Installation Cable. 24 AWG Solid Copper Wire. 3 Pair / 6 Wire. Wire Colors Blue / Blue White. 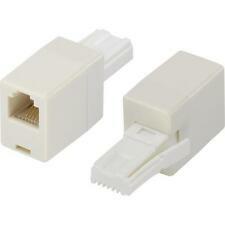 10Pcs RJ11 6P4C Telephone Phone Line 1 Male to 2 Female T Splitter Adapter Ivory. Condition is New. Shipped with USPS First Class Package. Length: 100 Feet. Color: White. 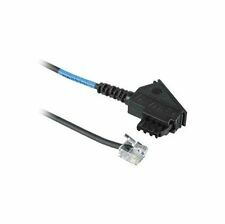 Sehr Hochwertiges DSL-Kabel (TAE/RJ45) für den IP Anschluss. geeignet für ADSL (6 Mbit/s) und das schnelle Hochgeschwindigkeits-Internet VDSL mit bis 100 Mbit/s. (PDF Datei). EAN: 4025125531211. Cable for fixed installation. The standard sheath. colour is white. Product Title. to us, If you have any issues with your order. Get In Touch. are insulated and sheathed in PVC, making. Also available in other lengths. 10 Hubbell netSELECT NS772I ivory voice grade jack kits. Includes two jacks and a Decorator platform to mount them in so that they will match your existing electrical wallplates. (SKU # HUBNS772I-10PK; Weight: 1.25 lbs.). Attach the suction cup to the handset behind the earpiece, and plug the 3.5mm mono connector into any standard recording device. Uses inductive coupling, to reduce external noise. 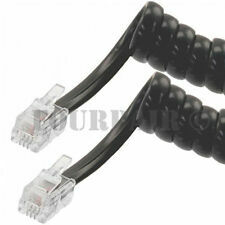 5-ft shielded cable. 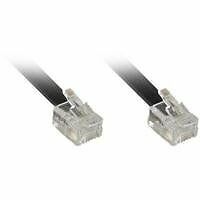 25m Telefonkabel 8x2x0,6mm JYSTY - 16 Adern - ISDN Fernmeldekabel Verlegekabel. 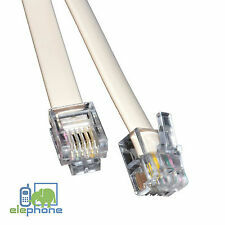 4 Pair 8 Wire White Internal Phone Cable. Reel Length (Imperial):328.08ft. Wire Gauge: 25AWG. of Cores:4Core/ 6Core/ 8Core. Colour White. of Max Strands x Strand Size: Solid. CCS conductors.